The Godless adventures presented here can be played separately or combined into the beginning of a campaign. Old folks tell children of the scary stories of Hog, a flesh-eating goblin who lives deep beneath the earth. For those who believe the stories, Hog is a nightmarish figure who dispatches blind mutants to the surface to harvest meat and other supplies. Some who have scoffed at the stories discovered their error much too late . . . In a Pig’s Eye is an adventure for starting characters who find themselves as dinner guests of Hog. This adventure puts the characters together in a dangerous scene, develops their origin story, and provides them with reasons to band together. The characters complete this adventure when they escape to the surface. This adventure is intended for use with the rules and story revealed in Godless: A World of Fire and Blood. If you use the adventure in Urth or a different setting, you will need to adapt the story and modify some of the technology to make it compatible. Finally, the story that begins in this adventure can be continued in either Dancing in the Ruins or Last One Standing, both available from Schwalb Entertainment. 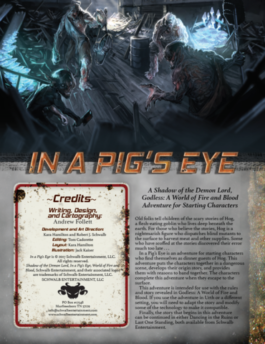 Buy In a Pig’s Eye in PDF or on DriveThruRPG. Isolon stands on the edge of a vast, trackless wasteland, a collection of buildings built atop the ruins of what came before. Positioned on the edge of a slow-moving river, it offers haven to travelers, protection from the horrors of the deserts, and succor for the hungry and thirsty. For all that Isolon promises, however, it is also a place fraught with peril, a community in the grip of a three-way struggle between rival gangs, a conflict that is beginning to tear the town apart. And it is in that conflict in which the player characters find themselves caught in the middle. For all that Isolon promises, however, it is also a place fraught with peril, a community in the grip of a three-way struggle between rival gangs, a conflict that is beginning to tear the town apart. And it is in that conflict in which the player characters find themselves caught in the middle. 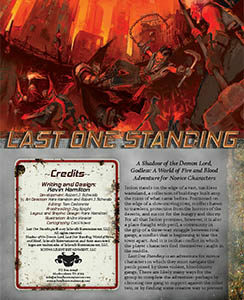 Buy Last One Standing in PDF or on DriveThruRPG. The Grand Fleet of the Party King has come to town, promising a life of plenty and unlimited pleasures for those permitted to join. But from all the desperate petitioners, the Party King takes only a lucky few. And even these soon find that life in the Grand Fleet holds more terror than pleasure, as plenty in post-Cataclysm comes at a high price. Dancing in the Ruins is an adventure for novice characters. In it, they seek to unravel the mystery of the Grand Fleet after the Party King’s ship breaks down. The group completes the adventure after they bring answers back to the waiting masses. This adventure was written for use with Godless: A World of Fire and Blood, which presents a post-apocalyptic setting for Shadow of the Demon Lord role playing game. You can run this adventure as a sequel to In a Pig’s Eye or to Last One Standing, or after some other starting or novice adventure. If you want to run this adventure in Urth or a different setting, you might have to make some modifications to fit the story into your world. 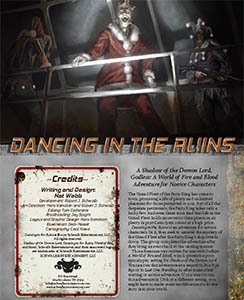 Buy Dancing in the Ruins in PDF or on DriveThruRPG.